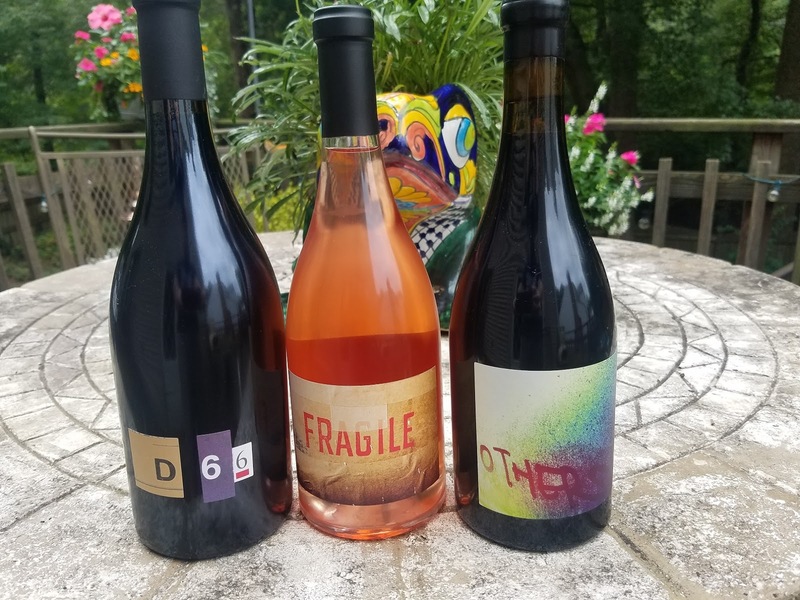 Jim and Lori Corcoran have been a leader in the #DrinkLocal movement in both Loudoun County and the Commonwealth of Virginia as proprietors of Corcoran Vineyards & Cider. 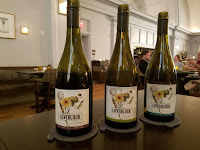 The couple established the winery in the early years of the Loudoun Wine Renaissance as Winery #11 when they planted the vineyard in 2001 and opened their doors three years later. Later, they were in the forefront of the local craft cider and beer, augmenting Corky's Farm with both beverages. Their menu includes cider as well as both dry and sweet wines as Lori specializes in unique dessert concoctions. The winery is open only on weekends and encourage picnickers, dogs and children. There's plenty of outdoor space. When visiting, Corcorans offers a separate cider or wine flight for $7 and a popular option for two is to split each flight. The cider starts with the delicious dry hopped Hop'n'Pop which uses locally grown hops to provide an IPA like finish to this refreshing cider. Another favorite is the PoPo Peach, a juicer cider that was fortified with peach juice. Finally, try the Knot Head, a proprietary blend of seven locally grown apple varieties then aged a few months in used Bourbon barrels. Excellent. Moving to wine, a tasting always starts with their Virginia Wine Lover favorite Apple Wine. This wine is made dry using several locally grown apple varieties and packs a wallop of flavors as the tartness and naturally acidity lead to a refreshing finish. Seyval Blanc was one of the first grape varieties planted in 2001 and this wine has been on the tasting menu since. In 2011 the winery received a shipment of Riesling grapes grown in the cooler mountains of the Shenandoah Valley. 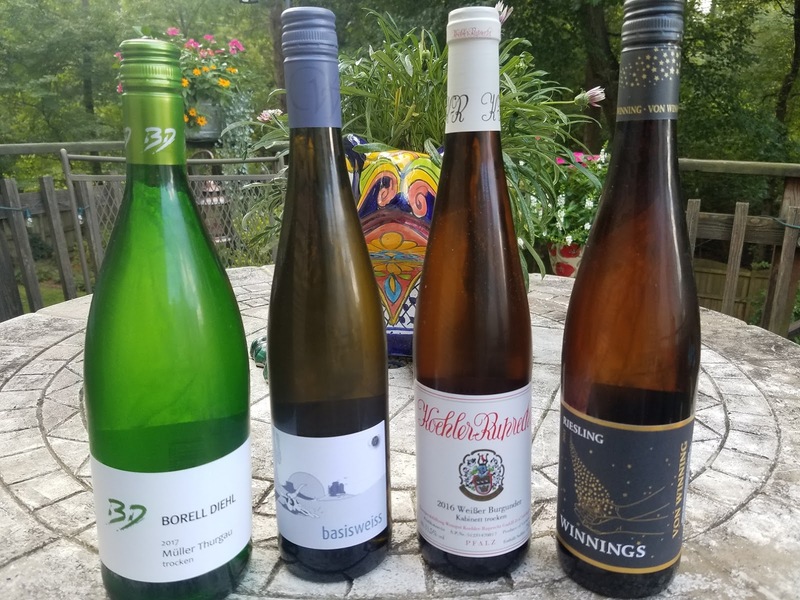 Lori recently found a lost palette and the wine remains vibrant with a slight petrol aroma, but traditional Riesling flavor. Lori does specialize in Chardonnay and during my last visit they were sold out with a bottling ready to proceed this summer. As for reds, Cabernet Franc is your choice, with multiple vintages available. A vertical tasting is an excellent method to witness the history of the area's weather and geology. The wine flight concludes with three dessert wines starting with the BlackJack where the Chambourcin base is fermented with blackberries and then blended with Petit Verdot and Merlot. The USB is also based on the estate Chambourcin but this time fortified with brandy and aged in whiskey barrels for 12 months. This a “Port-styled” wine is delicious. Finally and equally tasty is the RAZ Raspberry and Merlot blend which starts with the powerful berry flavors but finishes with soft tannins. Nicely done. The Awatere Valley is one of three major sub-regions Marlborough and is situated in a valley running parallel with the east coast of the South Island. The Awatere River, which flows south from Clifford Bay, gives the region its name – awatere meaning "fast-flowing river" in the local Maori dialect. The Wither Hills in the north separate Awatere from the Wairau Valley, another large sub-region. When Kim and Erica Crawford decided to return to viticulture after selling the highly successful Crawford brand, they settled on a plot of land in the Awatere Valley that "stole our hearts". They renamed the property Loveblock Farm and established two vineyards Hillside and Woolshed & Triangle. The Hillside is 180 acres of predominantly Sauvignon Blanc and Pinot Gris with experimental plots for Pinot Blanc, Tempranillo, Gewurztraminer, Chenin Blanc and Riesling. According to Erica, the winds on the Hillside can be challenging but they benefit the grapes by reducing the bug population and disease as well as providing slow vine growth which leads to very small berries and high aromatic concentrations. The Woolshed (27 acres of Sauvignon Blanc) and Triangle (4 acres of Pinot Gris) vineyards are closer to the valley floor and consist of the well-draining soils mentioned above. As the vines dig deeper, the berries gain in minerality. These vineyards are also certified organic where the "organic management reduces the vigor of the vines, reducing berry size and hence overall yields". Cheers. The Crawfords also own a 20 acre vineyard in Central Otago, the southernmost wine region in New Zealand where Pinot Noir is the signature grape. According to Erica, this region has more limestone soils and a colder climate - both conducive for this noble grape. These cooler conditions are noted for a large diurnal temperatures which help grapes retain acids. The climate is also dry creating soils with high mineral content where the vines focus on "producing small, highly concentrated berries. The Someone’s Darling vineyard is located on the Bendigo Loop Road which is the warmest of the Central Otago wine growing areas and according to Erica, their "vineyard is the warmest one in Bendigo ensuring consistent ripening year on year". This month Erica Crawford conducted a media briefing across the U.S. and provided dinner, samples, and answers to numerous questions concerning their operation. 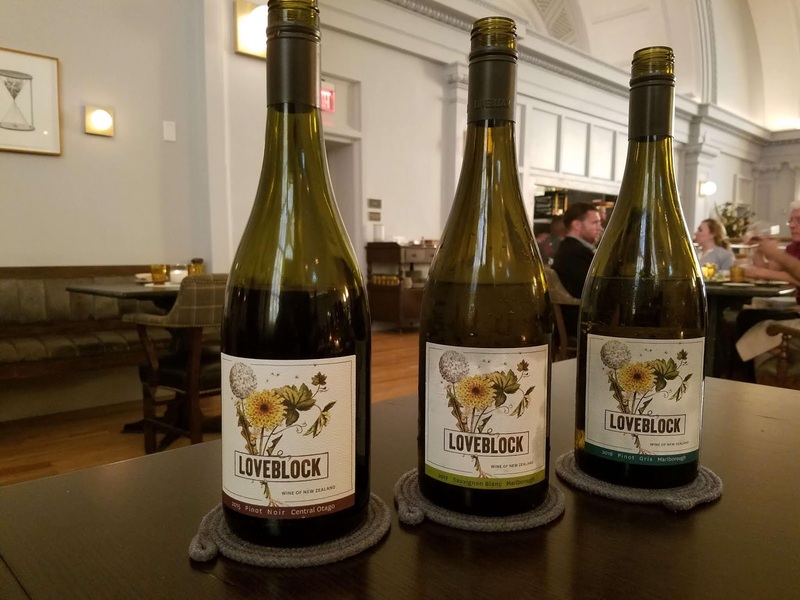 Here are brief descriptors of these vegan friendly and delicious Loveblock Wines. Sourced entirely from the organic Woolshed estate vineyard. The grapes are harvested at a low brix to produce a dry wine with low alcohol levels. If you consider Pinot Gris somewhat boring this wine will change your perception as there's abundant fruit character as well as an inherent minerality that lingers with the racy acids. Easy to see how this wine sells as well as their Sauvignon Blanc in commonwealth countries. Sourced from the aromatically inducing vineyards of the Awatere Valley where 90% of the wine's grapes are certified organic. The vines are cropped to allow for sun and air circulation and cover crops force the vines to dig deep for nutrients. Several of the harvested batches were fermented in neutral French oak and these along with a quarter of the wine fermented in steel underwent full malolactic fermentation to reduce acidity. The result is far from your standard New Zealand Sauvignon Blanc. Instead of lemongrass and green flavors; layers of stone fruit, noticeably peaches, fold together complemented by herbaceous notes and fresh acidity. According to the tasting notes, the warmer conditions at the Someone’s Darling vineyard site provides more robust flavors and the five Pinot Noir clones (B777, B667, B115, Clone 5 (Pommard) and Abel) each contribute to create a broad spectrum of aromas and flavors. I detected a combination of barnyard and tobacco aromas that lead to the classic cherry character blended with black pepper spices. The tail finishes with just enough acids and tannins to provide uplift. My type of Pinot Noir. 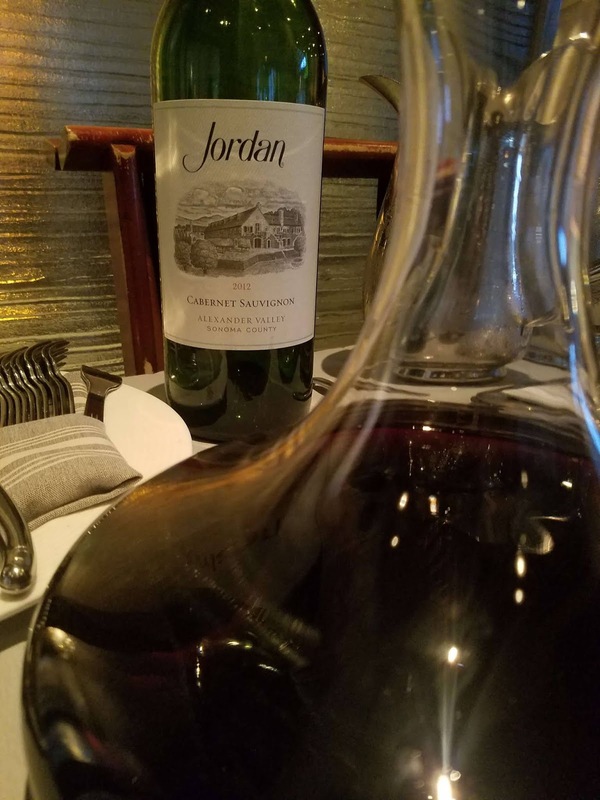 Jordan Vineyard & Winery has been an iconic producer of Sonoma County Cabernet Sauvignon since practically its first release in 1976. Their estate is located in the Alexander Valley AVA - just north of Healdsburg - which is the largest wine region in the county. The AVAs boundaries have changed slightly over the years but the the original border extended from the banks of the Russian River eastward to the foothills of the Mayacamas Mountains and is sheltered by the moderating influences of the Pacific. This means the day times are dry and hot whereas the colder night temperatures create a large diurnal temperature swing leading to slowly maturing grapes and intense acids. The 2012 Cabernet Sauvignon contains 77% Cabernet Sauvignon, 16% Merlot, 5% Petit Verdot; and 2% Malbec from the Jordan estate and an allotment from 16 family growers. The fermented wine undergoes a year of oak treatment in various vessels and toast before final release. Winemaker Rob Davis considers 2012 "a phenomenal growing season" and this is exhibited in the wine, even a few years after its initial release. The wine is still considerably fresh with solid black fruit, a creamy mid-section, and a long soft landing. This wine is phenomenal on its own and will still pierce through any red meat. Since its inception, Jordan Vineyard & Winery has offered visitors sparkling wine, initially true Champagne, but later sparkling wine from sister winery J Vineyards & Winery. 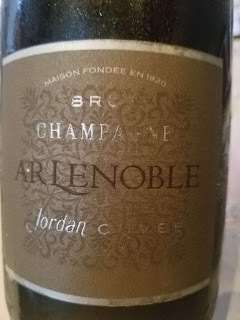 After J Vineyards became part of the Gallo empire, Jordan returned to the past and established a relationship with Champagne AR Lenoble in France as bother wineries share a "joint commitment to independent ownership, wines of balance and quality without compromise". In fact there are no financial investments or legal contracts -- the two wineries are independently aligned through mutual respect and friendship. This respect is born from AR Lenoble’s focus on quality by limiting yields in the vineyards, using exclusively first-press juice, and blending more reserve wine in its non-vintage bottling. 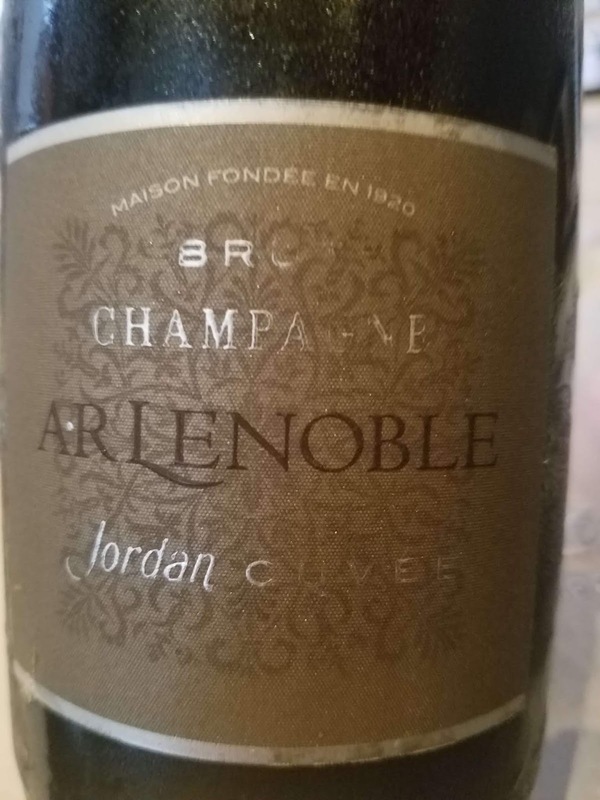 This holds true for the Jordan Cuvée which is a 2012 baseline blend of 30% Grand Cru Chardonnay; 35% 1st Cru Pinot Noir, and 35% Pinot Meunier using only first-press juice and 35% reserve wines. The wine is then aged 4 years on the lees with 18% aged in oak barrels and then aged in bottle for a year. And the sparkling wine is fantastic, starting a little bready but then transitioning to a creamy, racy citrus finale that persists long after the bubbles. Another iconic and even more historic producer of California Cabernet is the Livermore Valley's Concannon Vineyard. The winery is "America's oldest, ongoing winery under the same family label and stewardship" and more importantly the source of approximately 80% of California Cabernet Sauvignon through three cones of a single vine imported from famed Château Margaux. And this Mother Vine is located at the beginning of a row near the auxiliary house not far from the winery's main tasting room. 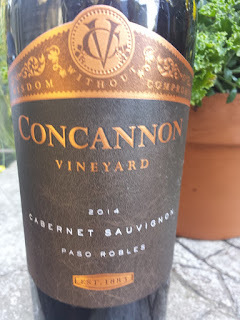 Besides their Livermore estate, Concannon produces wine from other appellations such as Paso Robles, an area making a statement with Cabernet through the Paso Robles CAB Collective. The affordable wine is made in part from the Concannon clones and is a blend of 87% Cabernet Sauvignon, 6.5% Petite Verdot, and 6.5% Petite Sirah. This is a bold wine, yet restrained; dense, but flows effortlessly throughout the palate. Dark fruit mingle with spices and chocolate before finishing with a silky and smooth. A bargain at this price. New Zealand's modern wine industry began in Marlborough in the 1970s with growers planting Sauvignon Blanc and Pinot Noir vines in the southern Wairau Valley. Nowadays, Marlborough Sauvignon Blanc and Pinot Noir are world famous and the Wairau Valley is home to some of New Zealand's most famous producers. One of these early growers was the Rose family who planted their estate vineyards on the banks of the Wairau River. "The Wairau Valley is one of three zones – along with the Southern Valleys and the Awatere Valley – which make up the heartland of New Zealand's Marlborough wine region. It accounts for approximately 45 percent of plantings within the wider region. It is a wide river valley that follows the Wairau River from the Spenser Mountains in the west to the Pacific at Cloudy Bay. The Richmond Mountains in the north separate it from the sunny region of Nelson, and the Wither Hills in the south protect the valley from harsh weather systems from the south-east. The Wairau Valley has a warm, dry climate that is moderated during the growing season by sea breezes from Cloudy Bay. Hot sunshine during the day and cold ocean winds at night extend the ripening period in the grapes, leading to a balance of fruit complexity and acidity. This diurnal temperature variation is essential to the terroir in the Wairau Valley – without it, much of the classic punchiness of the wines made here would be lost." -- via Wine-Searcher. After supplying popular producers with grapes for most of the 1980s, Phil and Chris Rose established Wairau River Winery in 1991 taking its name from the river on whose banks Phil and Chris Rose hand planted their first vines in 1978. In total they maintain ten estate vineyards all benefiting from different numerous meso-climates within the Wairau Valley sub-region. The winery is a complete family operation with siblings winemaker Sam Rose handling the cellar and Caroline Rose responsible for the Wairau River restaurant. 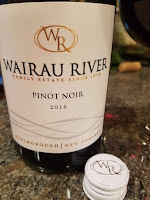 I recently received a sample of their Wairau River 2015 Marlborough Pinot Noir ($24.99). This wine is 100% Pinot Noir sourced from three estate vineyards located along the Wairau River: Home Block, Spring Creek, and Winery Block. The vines are cropped to enhance the intensity and color and after fermentation the wine was aged 10 months in large French barriques. The result is a generous velvety cherry fruit profile which transitions to soft spices and then very approachable tannins. Nicely done. I'm less familiar with Croatian grape varieties as I am with Hungarian, but this last trip to Hrvatska expanded my knowledge. Like Hungary, Croatia has a long wine tradition dating back to pre-Roman periods with many wins favored by nobility throughout Europe. Here is a subset of Croatian grape varieties to start your studies. Grown throughout Dalmatia as a replacement to the disease ridden Crljenak Kaštelanski and now the most important red wine grape in Croatia. Plavac means blue, and Mali means small but this offspring of Crljenak Kaštelanski and Dobričić packs a punch with cherry flavors, spice, and tannins. The high alcohol and acidity lead to solid aging potential as in the Plavac Mali wines from Miloš Winery. Although not indigenous to Croatia, Graševina (Welschriesling, Olascsrizling in Hungary, and Laški Rizling in Slovenia) is the most widely planted wine grape - particularly in Slavonia where it thrives on cooler soils and a continental climate. It is intended to be consumed young and shows its popularity and the Croatian equivalent of boxed wine. However for those producers producing a deeper style, minerality replaces some of the fruity and flowery characters with the remaining crisp acidity. The Krauthaker Graševina Mitrovac was one we discovered. There's also the Adžić Winery Graševina available in the U.S.
Malvazija (Malvasia in Italian) comes from the Istria peninsula and is known for creating intense wines that can be drunk young like a fresh Sauvignon Blanc or barrel aged for a more complex style. One of these with excellent minerality is the Piquentum Malvazija Blanc. A popular grape coming from Dalmatia and associated with islands of Hvar and Korčula. These wines are flavorful, rich and textured with strong aromas and refreshing notes. Toreta Winery is a large producer of this grape. Babić are blue wine grapes grown mostly in Dalmatia. These are full bodied wines featuring dark berries, plums, and figs, as well as distinct spices. The Bibich R6 Riserva blend is a great example. This grape is native to the island of Hvar in Central Dalmatia, translates to “a godsend”, and is traditionally drunk during religious festivals. 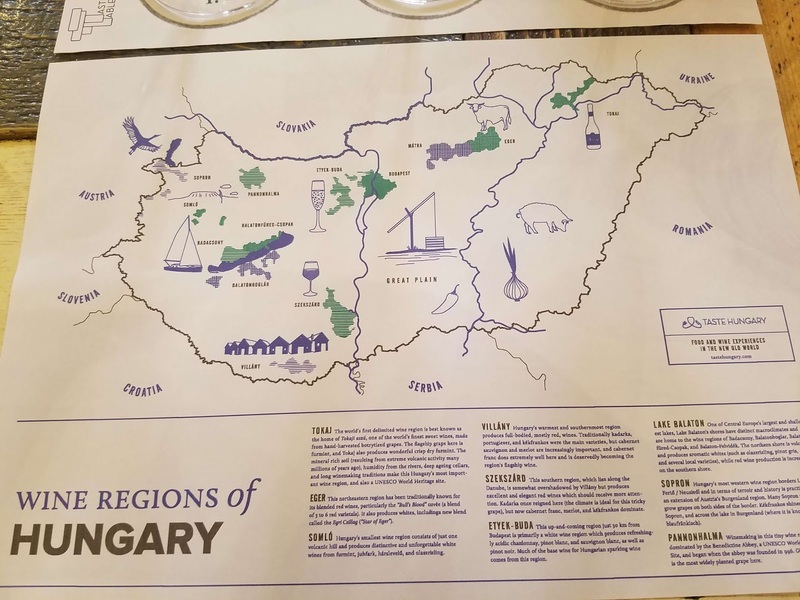 The Carić Vina is the only version of this wine exported to the U.S. This grape is from the island of Šolta (near Split) and with Crljenak Kaštelanski is the other parent of Plavac Mali. The grapes are extremely dark red and creates a purple wine -- sometimes called “the darkest wine of Dalmatia”. The grapes do not produce much sugar so varietal wines are low in alcohol as well as extremely low in acids. But be prepared for a tannic tail to create s bitter sour cherry finish. While visiting Šolta stop by Agroturizam Kaštelanac to taste different styles of Dobričić. Vrbnička Žlahtina is mostly grown on the island of Krk, the largest of Croatia’s 1000+ islands, and benefits from colder climates. It produces light, refreshing white wines with floral and white fruit aromas. Try the Šipun Žlahtina. Up until a century ago, this grape was the most widely planted in Istria. In best of times the wine is "ruby-red, almost purple wine of a typical, fruity aroma that is easy to recognize, and has hints of berries and pepper, unusually high acidity and high tannins and not too high alcohol content: 12 – 13%". Good luck finding it outside of Istria since there is an EU dispute with Slovenia over naming rights. Dingač is not a grape but a Plavac Mali wine produced in the Pelješac sub-region of the Middle and South Dalmatia wine growing region. Its included here because there can be some confusion on its definition. This grape is generally the primary grape variety in the Eger and Szekszárd Bikavér blends but is also well suited in the Villany and Sopron regions where the later has the largest plantings in the world. The dark skinned grape provides juicy fruit with noticeable acids and tannins. See Pfneiszl Winery in Sopron & Böjt winery in Eger. 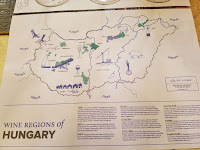 Before the Communist terror, this was Hungary's most famous red wine grape. However, due to its extreme late ripening, susceptibility to disease, and the need to control its vigour, the Communist regimes preferred other red grape varieties. It is still a common component to the Bikavér blends providing minimal tannins, but decent acidity, ripe red fruit flavours, and a spicy tail. There are also several wineries producing excellent 100% varietal Kadarka wines such as Eszterbauer Kadarka Nagyapám and the Heimann Winery Kadarka. The most widely planted grape in the Carpathian basin and introduced into Hungary earlier in the 20th century. Does particularly well around Lake Balaton, Somló, and Eger and it's full body is compatible with oak aging to alleviate its unique bitter almond character. Gere Attila Winery in Villany; Káli-Kövek Winery in Badacsony. Unlike most of the grapes that start with “kek” (which translates as “blue” in Hungarian), Kéknyelű translates as “blue stalk.” This grape was once widely planted but almost disappeared during the Communist era as it was replaced due to its limited yields and temperament. It is now found almost exclusively on the north shores of Lake Balaton, where it produces elegant wines with creamy structure and subtle acidity. Think Viognier with minerality as in the Szaszi Birtok Badacsonyi Keknyelu 2017. This grape is included in the list because of it's Hungarian name that translates to "grey monk" - most likely a result of monks bringing the wine to the volcanic soils surrounding Lake Balaton. A modern version from VáliBor in Badacsonyors is rather tasty. Languedoc-Roussillon, the wine region in southeast France lies adjacent to the Mediterranean coastline and runs from the Spanish border to Provence. According to Karen MacNeil's The Wine Bible, this region is considered the single largest wine producing region in the world and accounts for a third of total French wine production. Roussillon refers to the French part of historic Catalonia corresponding to the administrative Department 66 Pyrénées Orientales. Côtes Catalanes is a sub-region or IGP (Indication Géographique Protégée) in Roussillon snuggled next to Spain with vineyards covering the eastern foothills of the Pyrenees mountains. The Mediterranean provides a hot and dry clinate with generous sunshine: 320 days of per year. The soil is driven by the mountains and consists of "black schist, with small deposits of granite and limestone in red, rocky soils known as angile". And with its ties to Catalonia -- Grenache, Carignan, and Mourvedre grapes are major players. Dave Phinney discovered the region about a decade ago while visiting friends near Maury and immediately purchased a plot of vines. A year later he started constructing a winery and enlarging his holdings to 120 hectares (300 acres) where Department 66 Wine now calls home. 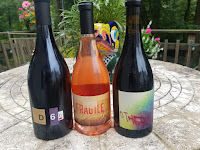 I recently received samples of three of their releases which were all well made and delicious. Cheers to Department 66. 2017 Fragile ($18) - a blend of Grenache with small percentages of Syrah and Carignan. Simply delicious. Strawberries and grapefruit are positioned within a nutty depth and persistent acids. The bottle was gone in a blink of an eye. 2015 Others ($25) - a blend of Grenache, Carignan, Syrah and Mourvedre grapes harvested from 10 to 65+ year old vines. The fermented wine was aged in 30% new French oak for 18 months and aged five months in the bottle before release. A deep wine with dark fruit; herbaceous and spicy too. Finishes with lingering acids and tannins. 2014 D66 ($38) - a blend of Grenache, Syrah and Carignan grapes harvested from 10 to 65+ year old vines. The fermented wine was also aged in 30% new French oak for 18 months and aged five months in the bottle before release. A brilliant wine. As deep and dark as the Others, but more velvety and creamy texture with silky smooth tannins.